WALLTITE® is used to restore the structural stability and reduce the thermal transmittance of existing cavity walls, with masonry inner and outer levels, in which the conventional wall ties have corroded. It is also used in new construction where its superior thermal performance and resistance to flood water is of importance. It has excellent resistance to driving rain and can be installed in all geographical exposure zones. WALLTITE® is also ideal where the need to reduce air leakage is important. The foam seals the cavity, does not shrink or allow air to pass through it, therefore air leakage through the cavity can be reduced to zero. WALLTITE® stabilises the wall by adhering to the inner surfaces of the cavity and providing a continuous structural connection between the two leaves. The system can also be used on random stone walls that form uneven cavities. WALLTITE® has undergone various performance tests. Certificates are available on request. Habitable space: plasterboard and skim/VCL with taped joints (VCL to be carefully cut and sealed around struts, ceiling joists and penetrations); batten/counter batten rafters as necessary to achieve insulation depth, confirm rafter strength sufficient to receive counter battening and boarding if required. Loft space only, non habitable: insulated between and over rafters 7to achieve target U-value. WALLTITE® may remain exposed. The Energy Company Obligation (ECO) is a funding mechanism launched in 2013 designed to target the refurbishment of existing housing stock. The objective is to support the Government’s programme of reducing carbon emissions from domestic properties by increasing their energy efficiency. The Department of Energy and Climate Change (DECC) suggests that the capital value of the remedial work required is in the region of £58 billion. Clearly the programme to refurbish housing presents enormous opportunities for the building industry. ECO recognises the need to improve the thermal insulation of wall structures and will provide funding for fitting insulation onto solid walls and into hard to treat cavities. The most recent English House Condition Survey suggested that there are currently around 3.2 million houses in the UK that have hard to treat cavities. The most cost effective and least disruptive way to treat cavities of this kind is to inject insulation material directly into the existing cavity. Recognising the potential for this type of refurbishment, BASF developed a version of its WALLTITE® spray foam insulation specifically for injection into existing cavities. WALLTITE® CV 100 is the injection grade. Applied in liquid form, the WALLTITE® CV 100 takes fractionally longer to expand into its finished closed cell foam, ensuring that all irregularities within the cavity are covered, sealed and insulated. The product bonds permanently to any substrate material, providing additional structural stability to existing cavity wall structures. WALLTITE® will also provide an airtight insulation layer around a house whose fabric has previously allowed significant air leakage. 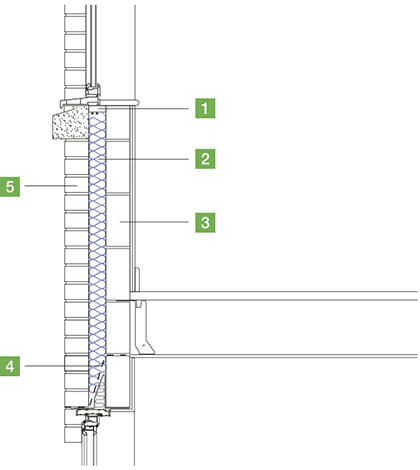 The injection process requires holes of just 12mm diameter to be drilled in the mortar. No bricks will be damaged and, once repointing has taken place, there will be no sign of the installation. Only BASF approved Foam Master qualified companies can install WALLTITE®. The results that can be achieved will vary depending on the material used, but calculations based on the use of WALLTITE® CV 100 rigid closed cell foam insulation injected into a 40mm cavity suggest that the U-value of the refurbished wall should be in the region of 0.46W/m2K to 0.56W/m2K depending on the make up of the internal and external walls.